Joint US-French-German mission will be the first dedicated to listening for seismic energy rippling through Mars. NASA’s InSight spacecraft — the first geophysical observatory ever sent to Mars — touched down safely on the Martian surface on 26 November. 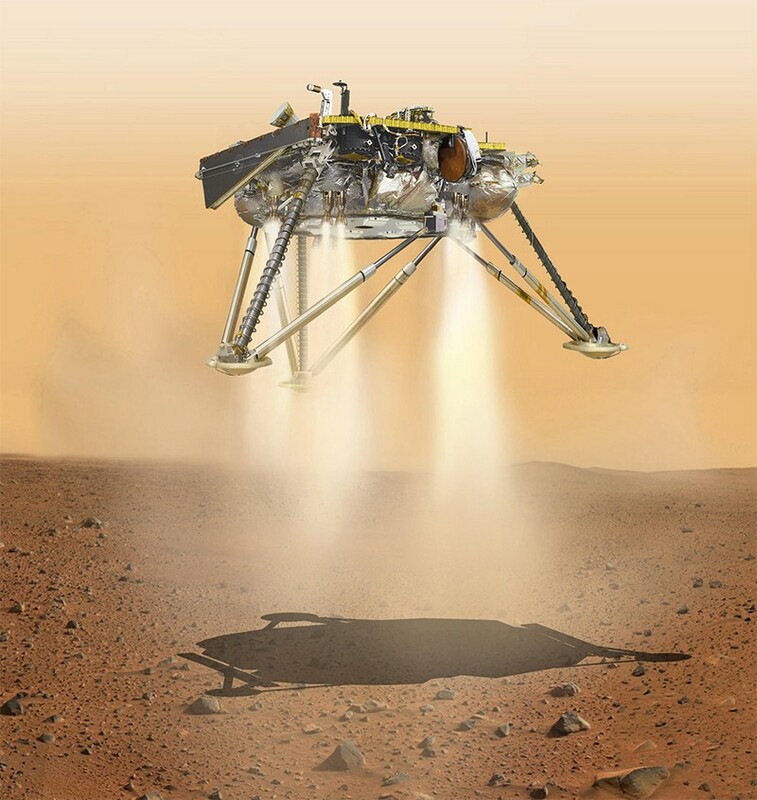 The three-legged lander sent confirmation of its landing, on Elysium Planitia, just before 11:53 a.m. local time in mission control at NASA’s Jet Propulsion Laboratory (JPL) in Pasadena, California. 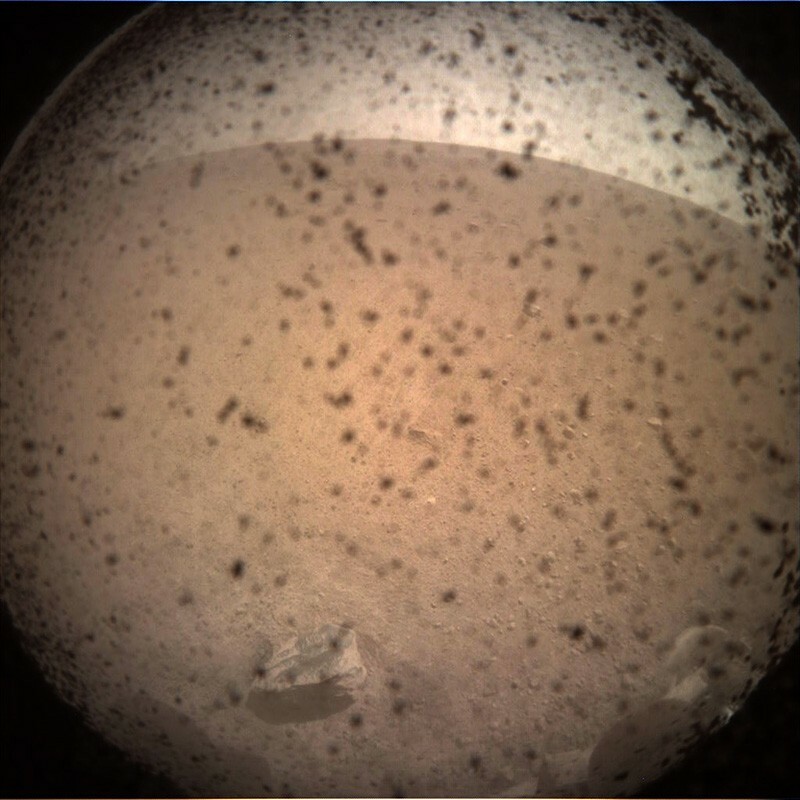 Several hours later, mission managers announced that the InSight's solar panels deployed successfully, a necessary step for it to collect scientific data. Each step of the spacecraft's landing sequence, which lasted just under seven minutes, unfolded as planned. InSight deployed its parachute, jettisoned its heat shield and fired 12 engines to help to slow it down. The first photo that InSight sent from the surface of Mars showed a flat, relatively rock-free landscape stretching to the horizon, with the foreground speckled with dust from the landing. Two small ‘cubesats’ that had flown alongside InSight conveyed﻿ the news of its landing as it happened. They were meant to relay communications in near-real-time from InSight to Earth as the spacecraft screamed through the Martian atmosphere. The slower alternative would have been to wait for an orbiting spacecraft to pass nearby, gather the information and relay it back to Earth hours later. InSight’s primary goal is to measure ‘marsquakes’ rippling through the planet, which should reveal how the planet is separated into a core, mantle and crust. Scientists can use that information to deduce how Mars and the Earth evolved differently over the past 4.5 billion years. The US$994-million spacecraft carries 6 seismic sensors, built by an international team led by the French space agency CNES. Three of them are mounted on the lander’s deck and will monitor shaking in the coming days. These sensors can pick up vibrations such as those caused by Martian winds — a source of noise that confounded attempts to measure marsquakes with the 1976 Viking landers. InSight's second major instrument is a heat-flow probe, built by the DLR German Aerospace Center in Cologne, to measure soil temperature down to 5 metres. Like the vacuum-packed seismometer, it too awaits deployment in the coming months. InSight’s was the first Mars landing since the European Space Agency’s Schiaparelli lander crashed in October 2016. Update 27 November 2018: Updated after NASA announced that InSight had successfully deployed its solar panels.